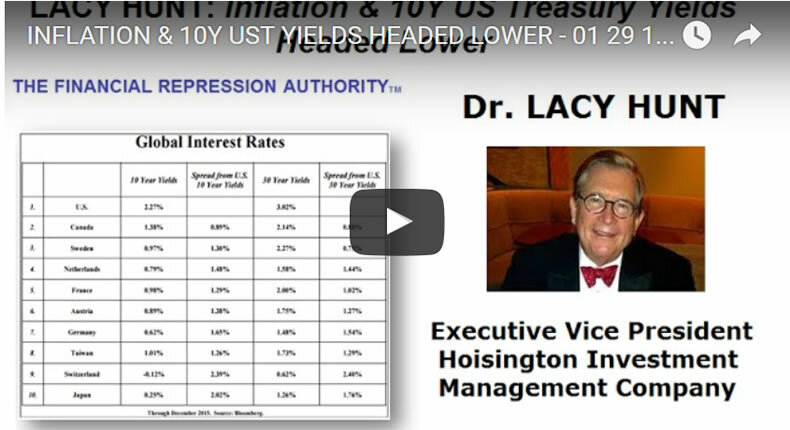 Dr. Lacy Hunt joins FRA Co-Founder Gordon T. Long in an in-depth discussion on the current debt dilemma and the decisions of the Federal Reserve. 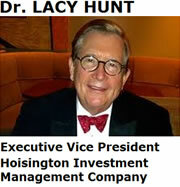 Dr. Lacy H. Hunt, an internationally known economist, is Executive Vice President of Hoisington Investment Management Company, a firm that manages over $5 billion for pension funds, endowments, insurance companies and others. He is the author of two books, and numerous articles in leading magazines, periodicals and scholarly journals. Included among the publishers of his articles are. Barron's, The Wall Street Journal, The New York Times, The Christian Science Monitor, the Journal of Finance, the Financial Analysts Journal and the Journal of Portfolio Management. Previously, he was Chief U.S. Economist for the HSBC Group, one of the world's largest banks, Executive Vice President and Chief Economist at Fidelity Bank and Vice President for Monetary Economics at Chase Econometrics Associates, Inc. A native of Texas, Dr. Hunt has served as Senior Economist for the Federal Reserve Bank of Dallas. Dr. Hunt received his Ph.D. in Economics from the Fox School of Business and Management of Temple University. Furthermore Dr. Hunt served on the Board of Trustees of Temple University from 1987 to 2010 and is now an honorary life trustee. He received the Abramson Award from the National Association for Business Economics for "outstanding contributions in the field of business economics." He is a life member of the American Finance Association. He was a member of the Economic Advisory Board of the American Bankers Association and Chairman of the Economic Advisory Board of the Pennsylvania Bankers Association. He served on the Monetary and Fiscal Policy Affairs Committee of the National Chamber of Commerce. "Debt only works if it generates an income to repay principle and interest." "In essence the way in which it worked was by signaling that real assets were inferior to financial assets. The Fed, by going into an untested program of QE effectively ended up making things worse off." "Monetary policies currently are asymmetric. If the Fed tried to do another round of QE and/or negative interest rates, the evidence is overwhelming that will not make things better. However if the Fed wishes to constrain economic activity, to tighten monetary conditions as they did in December; those mechanisms are still in place." "If you do not have pricing power, it is an indication of rough times which is exactly what we have." The fact that the Fed made an ill-conceived move in December should not be surprising to economists. A detailed study was done of the Feds 4 yearly forecasts which they have been making since 2007. They have missed every single year. The Fed begins the year with the high forecast and ts declines each forecast after that and by December it isn't much of a forecast because you already have 11 months of data. An empirical indication that QE has failed is the fact that their models have relied on them to be indications and the models were wrong which means the policies have also been a failure. "Another risk which may very well lead to a worse result is the Fed going to negative interest rates. First we must consider if the Fed can engineer negative interest rates and it is very likely they do have that capability. There will be severe consequences which we will not even be able to anticipate." "If the Fed went into negative interest rates they would ultimately be required to call in the currency and force people to use their bank deposits."